In a little log house in a Pennsylvania village, surrounded by apple orchards and wheatfields, one man puts his politics into words, and culls the works of like-minded men doing the same thing, and every Wednesday he publishes it on a new medium that ties together the nation like never before. He makes his nut running a print shop and a stationery store, but politics are his passion. And through his words, reaching out into homes and mansions across America, he helps shift the dynamics of the nation. I've been a newspaper editor and I've been a blogger. But it's in blogging that I feel closest to Charles Miner, the editor of the West Chester, Pa. "Village Record" newspaper of 1818. Political blogs today stand in opposition to "the media" as we now know it. But when the First Amendment was written, newspapers were the voices of politics, and the press was shockingly partisan by modern standards. It made no pretense to being fair and unbiased. Editors trumpeted their champions and execrated their enemies. They knew no scruples about conflict of interest; conflict was their interest. 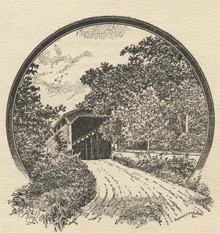 Miner was a Connecticut native, the son of a printer, and he learned his father's trade before coming to the Wyoming Valley in northeastern Pennsylvania in the late 1790s. He worked in a sugar camp and earned 105 pounds of maple sugar, which he hauled into town on his back and exchanged for provisions to start settling the territory. But Charles was more of an intellectual than a pioneer, and soon he was teaching school. He taught two terms and in 1804 married a fifteen-year-old girl who had been his pupil. In 1802, Charles and his brother Asher had begun publishing the "Luzerne Federalist and Susquehanna Intelligencer" in Wilkes-Barre. He also had a creative flair, writing a ballad poem that was popular in its day, and in 1815 he published a book of essays, "From the Desk of Poor Robert the Scribe." In one of them he coined the phrase, "He has an axe to grind," but perhaps since the title of the book suggested Poor Richard of almanac fame, Charles Miner's one lasting contribution to the American vernacular is usually credited to Ben Franklin. In 1817, he came to West Chester, bought a small newspaper, and renamed it the "Village Record." He'd be up at 5 a.m. on winter mornings, reading some political or literary journal by the light of a coal fire, reading always aloud, for the benefit of his blind daughter Sarah. One gets a picture, through various reminiscences, of a man of pleasant eccentricities, at the same time formal and pleasant. A daughter recalled that "he had geese and taught them to dance for their food while he whistled the hornpipe." "I don't know how he managed to teach them," she wrote, "but I know he was above the use of hot plates." Printer, publisher, business manager, and editor were all one job in those days. "The personal appearance of Chas. Miner in this office is well remembered," one West Chester old-timer recalled decades later, "especially on publication days, when with a short apron of green baize or flannel he took an active part in issuing the Record, his kindly countenance and manners leaving a pleasant impression on the memory that more than half a century has not effaced." 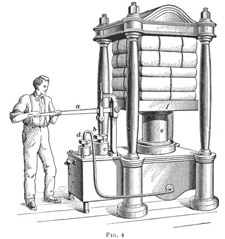 Miner bustled over the type trays, with an apprentice or two to help him, while the foreman worked the press by hand, using two large cushioned balls to apply the ink to the types. He built up his readership until by 1821 he had passed the 2,000 mark. Not remarkable, but it was more than twice the entire population of the town where he published. And that's an important difference between newspapers then and now. If you didn't read the address in the masthead, you might have no idea where the "Village Record" was published. There was almost no local news; all of it was national and political. Miner's audience was the party, not the public, so he tailored his message to the faithful. His medium was the U.S. mail system, and he made sure the "Village Record" reached every corner of America where the Federalist Party still held influence. As early as 1819, Miner arranged same-day delivery to Philadelphia subscribers. A notice in 1827 mentions subscribers in Georgia, Ohio, Kentucky, Illinois, Indiana, Louisiana, New Jersey, and Massachusetts. Kentucky's Henry Clay, then a rising political star, was a regular correspondent to the "Village Record" during the 1823 presidential campaign. Publishing brought a sense of power, but there wasn't much money in it. Miner ran a farm to help feed his family. To keep the cash flowing Miner ran a stationery department from his office, selling parchment, paper, ink almanacs, copy books, schoolbooks, and globes. In 1826 he advertised London-made celestial and terrestrial globes, which he promised would be sold "for less than their value -- as they belong to a person who would give the whole celestial and terrestrial globes for a portion of that ingredient which affords comfort in the terrestrial only." From Charles Miner in his green apron to a horde of ankle-biters in pajamas. From mail coaches to Internet servers. I think blogs today are a lot like American newspapers circa 1820: In their identification, in their operation, and increasingly in their financing. The present is the past; what's different between 1820 and 2004 is the modern, monolithic "mainstream media," With its untenable claim to god-like authority and inhuman impartiality. Blogs are unabashedly polarized, politically. They devote a good deal of their time to slamming each other, and printing approving accounts of speeches from members of their own side, while reporting the nefarious deeds of the political leaders of the other side. So did Miner and his peers. They are small-bore operations run largely by one or two publisher/editors who have writing and opinion-making in their blood, not by a team of 30 or 40 j-school graduates. They are produced with comparatively cheap equipment, yet they are capable of reaching wide and influential audiences. They originate from somewhere, but their identity is rootless. And like old-time newspapers, the challenge is in making them pay. The third leg of the comparison, the financial one, is starting to fit into place. With the emergence of blog-ads, a blog's success will be measured by the numbers and loyalty of its like-minded readers. © January 20, 2005 Douglas Harper Moe: "Say, what's a good word for scrutiny?" Shemp: "uh ... SCRUTINY!"